4Easysoft Flip Converter is designed to convert Flip video created by any Flip series to any other video/audio formats like MOV, M4V, AVI, 3GP, FLV, HD video and AAC, MP3, OGG, WMA, etc for any players. This Flip Movie Converter also possess more powerful editing functions of effect, trim, crop for you to recreate your video: adjust output video effect, capture any time-length clips and crop video play region and add watermark on your video, etc. Convert all Flip video shot by any series of Flip devices- Mino HD, Mino, Ultra HD, Ultra. Convert Flip video to MPEG-4, H.264/MPEG-4 AVC, MOV, M4V, AVI, DivX, XviD, ASF, WMV, MPEG-1, MPEG-2, 3GP, 3GPP, MKV, FLV, SWF, VOB, HD video and AAC, AC3, AIFF, AMR, AU, FLAC, MP3, M4A, MP2, OGG, WAV, WMA audio. You can catch your favorite screens when previewing and save them in JPG, BMP, GIF picture formats. Aallows you to set the video Brightness, Contrast, Saturation to meet your needs. Crop the video play region. Join separated files into one. 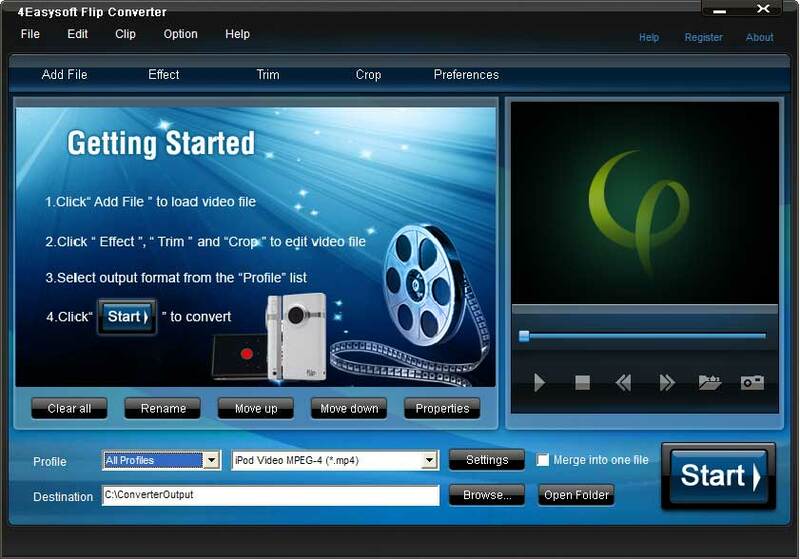 Customize output settings: Set the Video Encoder, Resolution, Frame Rate, Video Bitrate. Qweas is providing links to 4Easysoft Flip Converter 3.3.20 as a courtesy, and makes no representations regarding 4Easysoft Flip Converter or any other applications or any information related thereto. Any questions, complaints or claims regarding this application 4Easysoft Flip Converter 3.3.20 must be directed to the appropriate software vendor. You may click the publisher link of 4Easysoft Flip Converter on the top of this page to get more details about the vendor.